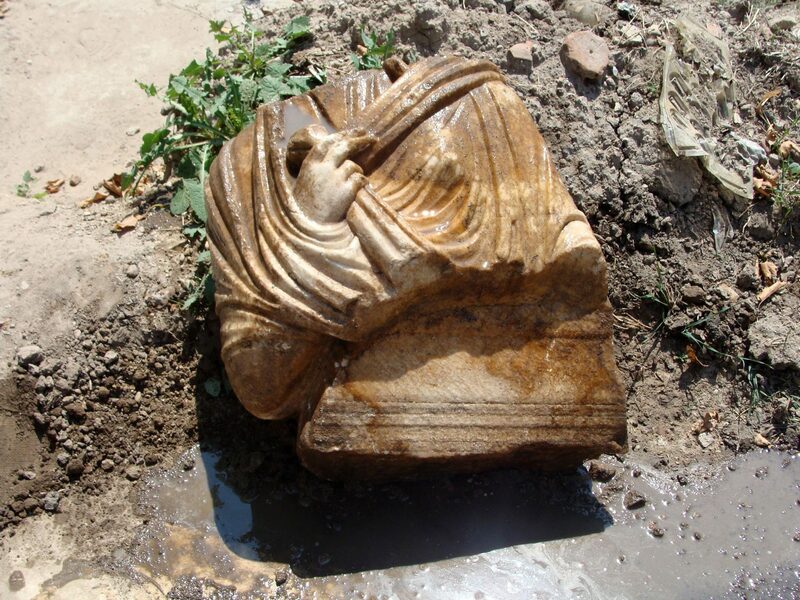 Both statues are with missing heads but their discovery is nonetheless significant because were possibly part of the Ancient Forum excavated by the team of archaeologist Elena Kisyakova from the Plovdiv Museum of Archaeology. The excavation site of the Ancient Forum of Plovdiv, which was known as Philipopolis in the Hellenistic Period (after it was conquered by King Phillip II of Macedon in 342 AD), and as Trimontium in the Ancient Roman period (after all of Ancient Thrace was annexed by the Romans in 46 AD), is located near the Central Post Office in the downtown of the modern-day city. 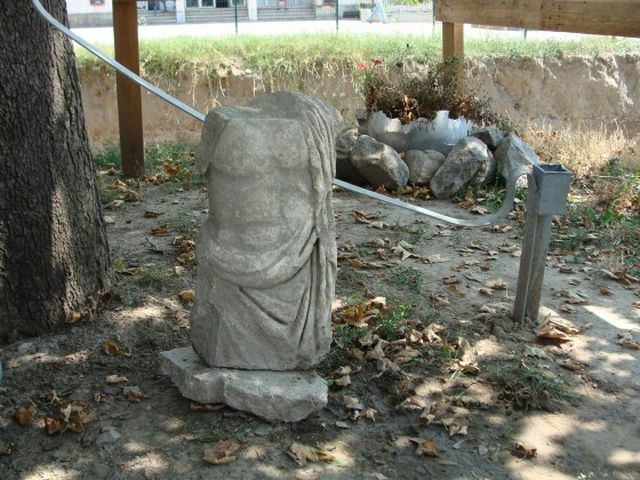 According to Kisyakova, the newly found statues date back to the height of the Roman Empire – the 2nd-3rd century AD, reports local news site Plovdiv24. What is more, both statues were used for the construction of structures built in the Middle Ages. “We have found parts of two statues which were integrated into medieval structures. This is very interesting. At first reading, one of them is a bust of a woman, and the other find is part of a [male] statue. Both date back to the Roman Period," says the lead archaeologist. “I hope that some day they will be exhibited here at the Forum. We have found a number of statues already, which comes as no surprise to us. It is normal to have statues at the Forum – of both the Emperor’s family, and other prominent figures," Kisyakova notes. The male statue is smaller than a life size, and the archaeologist thinks that it may have been positioned at a place used for religious rituals. The female statue is actually a bust with a pedestal; however, the lack of additional attributes makes it impossible to determine whether the statue depicted a deity or a member of the imperial family. The detailed depiction of the clothing on the statues testifies to the sophistication of the craftsmanship. Kisyakova notes that during the excavations of Plovdiv’s Ancient Forum so far her team has been discovering artifacts dating from the 1st until the 12th century AD. In 2013, the archaeologist excavating the site discovered a number of parts of Roman statues including the life-sized statue of a supreme magistrate holding a scroll, which was dated to the 3rd-4th century AD, as well as a head from another statue. Until the recent excavations of the Ancient Forum in Bulgaria’s Plovdiv, it had been believed that the facility was built in the 1st century AD. However, now there are indications that it is at least 100 years old, and that Ancient Philipopolis (Plovdiv) had a highly sophisticated and developed urban life before the arrival of the Romans. Today the prehistoric, ancient, and medieval settlement on Nebet Tepe has been recognized as the Nebet Tepe Archaeological Preserve. Some of the unique archaeological finds from Nebet Tepe include an ancient secret tunnel which, according to legends, was used by Apostle Paul (even though it has been dated to the reign of Byzantine Emperor Justinian I the Great (r. 527-565 AD)) and large scale water storage reservoirs used during sieges, one of them with an impressive volume of 300,000 liters. Still preserved today are parts of the western fortress wall with a rectangular tower from the Antiquity period.